After the very successful Primetime Bida TV series "Forevermore", now comes the movie that Liza Soberano and Enrique Gil, will once again make your expectation of "forever" more broader. 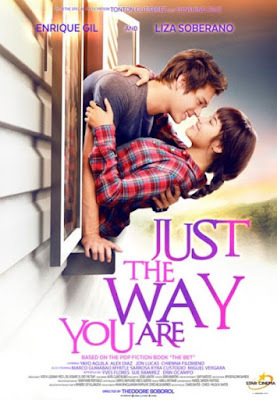 "Just The Way You Are" official teaser was recently out and the poster as well. It gone viral yesterday on the first hour of released. It seems that the story will revolved through a bet and the rest will follow until Drake (Gil) and Sophia (Soberano) fall in love. The usual hunkiness and good looks of Gil is present but Soberano is way far from the Agnes we loved in "Forevermore", in this movie. The movie will be shown on June 17, 2015 in cinemas nationwide. Directed by Theodore Boborol and writen by Ceres Helga Barios and Maan Dimaculangan-Fampule collaborated to adapt the the best-selling Pop Fiction book "The Bet". The movie also stars Yayo Aguila, Alex Diaz, Jon Lucas, Chienna Fomeno, Marco Gumabao, Myrtle Sarrosa, Kyra Custodio, Miguel Vergara, Yves Flores, Sue Ramirez and Erin Ocampo with the special participation of Ton Ton Guttierez and Sunshine Cruz. There will be a press conference on Monday and will be sharing more about the movie, directors and casts of the film.